Honor a Veteran or Service Member by Donating a Brick. You say that you would like to honor a veteran or active-duty service member. What better way to show your appreciation to a family member or close friend (or even yourself) who has served our country by donating an engraved brick in his or her name. 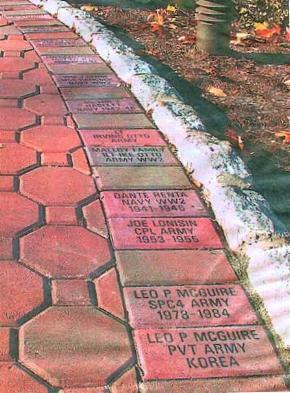 The Oakland American Legion is bordering the circle walkway in Veterans' Park with engraved bricks. The cost for each tax-deductible brick donation is $85. Various inscription styles are available. For more details or an order form, please call us at 201-337-9845.